Ever since you were able to hold a crayon, you’ve been instructed to color inside the lines. If you consistently color inside the lines, you are heaped with praise and judged to be a budding artist with tremendous upswing. The kids who regularly color outside the lines? Well, we’d rather not talk about them. Once you’ve mastered the art of coloring outside the lines, you need to make sure your color choices are proper as well. Blue for sky and green for trees, that sort of thing. It’s all a big smokescreen. None of this does anything to solidify your standing as a true artiste. (In fact, it encourages the opposite.) What it really does is teach you how to conform. Conformity is the goal governments have for their citizens, factories have for their workers, and teachers have for their students. It gets you to follow the law, do the job, and fill in the little ovals on tests. All without asking too many questions (or ideally, none.) Unfortunately, in our current world, governments have gotten too big for their own good, factories are closing down, and a diploma is less valuable than it’s ever been. Now, the ability to color inside the lines may be a good test to see how well young children are developing their fine motor skills. 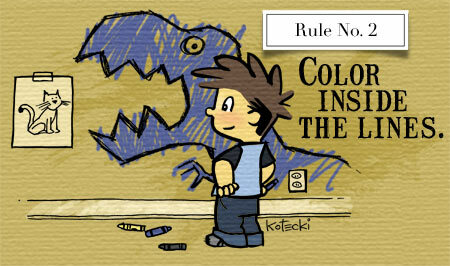 The problem is that the continual reinforcement to color inside the lines when we were kids gets stuck in our psyche. Many of us carry it with us our entire lives. When it comes to examples of conformity, look at the cars we drive. In 1909, Henry Ford said, “Any customer can have a car painted any color that he wants so long as it is black.” In 2009 — exactly 100 years later — the two most popular car colors were black and white. (And the next two most popular colors are grey and silver, which are a combination of the first two!) Add in blue and red, and those six colors make up 89% of all cars. “Other” clocks in a less than 1%. Conformity is a very good thing for governments, corporations and schools. But not so much for you. As adults, the only real reward for being the best at coloring inside the lines is a small measure of security. But it can come at the cost of unfulfilled potential and a boring story. Jesus. Ghandi. Mother Teresa. Martin Luther King, Jr. Amelia Earhart. Walt Disney. Harriet Tubman. John Lennon. Joan of Arc. George Washington. The greatest, most inspiring figures in the history of mankind have one thing in common: they were non-conformists. They colored WAY outside the lines. God created you to be something special, unlike anyone else who has or will ever live. He wants you to stand out and shine like the stars. Don’t be afraid to dance when others sit on the sidelines. Don’t be afraid to zig when others zag. Don’t be afraid to color outside the lines. You’re so good at expressing my thoughts! Thanks again for the inspiration your articles always bring to my inbox. I’m happy to take up residence in your brain, Vanessa. It’s very nice in here. THIS is one of the big reasons we homeschool our kids! Loved this article! Loved it! And for the record – we’re professional ziggers around here. In our new fast-moving world learning to color outside the lines could just save our job and sanity.